If you want to vote in an election — whether for city council, school board, governor, or president — you must first register to vote. You must register at least 29 days prior to the election. Voter registration forms are available at US post offices, California Department of Motor Vehicles and other governmental offices. Forms can also be mailed to you or downloaded from the web (see below). You must re-register any time you change your address. 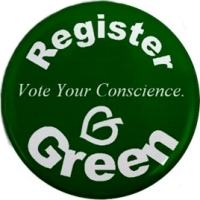 Registering Green is a way of 'voting' for your values. Join a party which stands for your values, instead of one that is the 'lesser of evils'. The Green Party of California was founded in 1990 and achieved ballot status in 1992. If you are already registered Green, help us register others. For more information on how you can help, call or email. Registering Green does not limit your voting options in the primary or general election for state and congressional office. Since you can vote for any candidate, choosing a party is really about what you believe in. To have a voter registration form mailed to you, call 1-800-345-VOTE. To download a voter registration form on the web in English, click here. Para hablar en Español, llame a 1-800-232-VOTA. Para obtener una forma en Español. Voter registration forms are also available in Chinese, Vietnamese, Tagalog, Japanese, and Korean. Much of the information on how to register has been drawn from the California Secretary of State's web page on elections and voter information.